How Do Solar Sun Rings Work? How Many Solar Sun Rings Do I Need? We recommend enough Solar Sun Rings be purchased to cover 70% to 80% of your pools surface, ignoring the small triangles between the rings. Are Solar Sun Rings Compatible With My Pool? How Do I Clean My Solar Sun Rings? 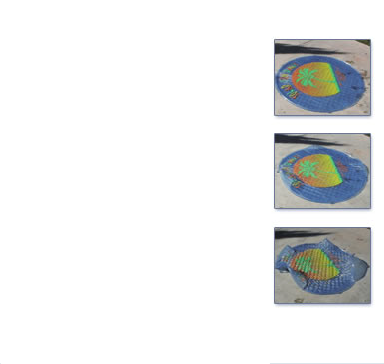 After removal from the swimming pool Solar Sun Rings can be easily cleaned with a sponge and mild detergent solution. CARE: Once inflated proper care of this product will greatly extend its useful life. Pool decking is designed to be abrasive to prevent slips and falls. Do not walk on Solar Sun Rings or drag Solar Sun Rings on this abrasive surface. When Solar Sun Rings are not on the pool water do not stack them in direct sunlight, excessive internal temperatures will develop and melt the vinyl films. 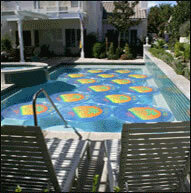 Solar Sun Rings are passive pool heating devices and should not be used as pool toys. What Are Solar Sun Rings? The Solar Sun Ring is a passive solar swimming pool heating device made from two sheets of heavyweight U.V. resistant vinyl. The upper clear layer holds insulating air and focuses sunlight on the blue colored lower layer. The blue layer absorbs about 50% of the sunlight and converts it to heat. The balance of the sunlight is allowed to pass through for deep water heating.